Another Festival of Fear is behind us…at least for another year. The month of August was pretty jammed for me as I was working on Gary’s freelance life. We launched a new site, set up an inventory system and did a lot of last minute running around for various sundries. 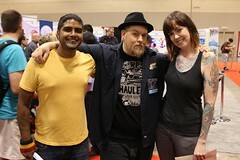 The culmination of all of this prep work was for Rue Morgue’s Festival of Fear at the FanExpo here in Toronto. Three days of smiling, chatting, shaking hands and exchanging hugs has left with with a bit of the “nerd flu” but I would not have it any other way. Normally I do not dress up for the Festival but on Friday I decided to go outside my comfort zone. I pulled out an old Halloween corset and wore it with a crinoline and lace vest for a bordello vibe. I loved it right up until the last hour when the plastic boning bent causing a welt on my waist. I am not surprised, the corset was a cheap find on ebay and I may even replace the plastic bones for steel ones and see if it can wear it a couple of more times. Oh and that necklace, so cute for the first few hours and then it started to fall apart. I believe I made it stay together through sheer will power (and maybe the help of a few safety pins). I need a date with some pliers and jump rings to make this bad boy behave. The moral of this outfit? Don’t wear a cheap corset for 12 hours and make sure to bring safety pins. I may have looked cute I was pretty annoyed with the whole thing by the end of the day. I was planning on wearing it out but instead switched out the corset for a really wide teal belt and headed out. I called it the “close-enough” corset and it was much more comfortable. 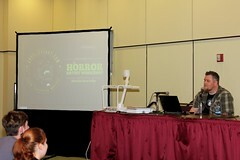 Watching Gary do his first “Horror Artist Workshop” was a really proud moment for me. He had such a great audience and he did a fantastic job. 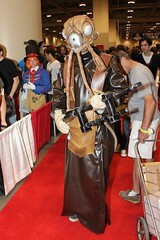 Having very little sympathy for our friend who dressed up like Zuckuss but was denied admittance to some kind of Star Wars Legion or something. I admit I was a bit lost in the conversation. 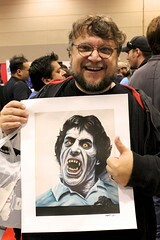 But, most of all meeting admirers of Gary’s art was the best highlight of the weekend. 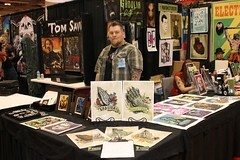 So many of you love his art and it is always fantastic to meet people that appreciate the sleepless nights and endless hours he puts into creating his work. 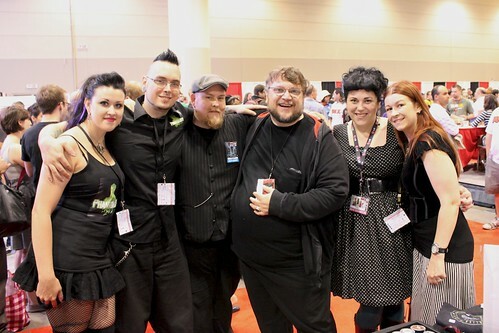 Meeting people at shows like this is certainly what makes sharing my husband’s time worth it. And would you believe it between all of this we managed to attend the wedding of our amazing friends Sue & Jeff. I will definitely be posting pictures of my wedding outfit and especially the bride’s dress. She was absolutely stunning.